Well the votes were cast and the result is in. It surprises me that it was quite as firm as it is. Based on the count so far 100% of you want me to post about my Mum’s place. Although a few of you did have a “bet each way”. 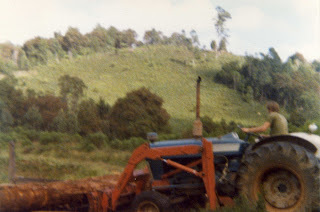 I had a look through my piccies of my trip to Mum’s and they took me in a different direction to that I had originally intended when I thought about this post. A couple of days into my visit Stan (Mum’s husband) and I set off “out the back”. I posted this piccie of Stan’s old Land Rover the other day because it was the vehicle we went out in. In case you wondered it’s a 1963 “series II” model (which means it’s around my vintage). Mum and Stan’s holdings are divided in two: the front block where their house is; and about four miles away (and about 1000 feet higher) is the “back block”. I took a piccie from inside the Land Rover. It’s not a great photo because I was bouncing around as the vehicle climbed the steep track. The scrub in this piccie is all regrowth from the past twenty years or so. Unlike most of Oz this north east corner of NSW is very wet and the forest begins reclaiming undisturbed country very quickly. Out the back, we climbed into low clouds, so what is normally a beautiful view of mountain country all around was concealed. Our destination was this little mill cottage (mill as in timber mill) that Stan relocated out the back in the 1970s. Deb, my three girls and I lived here for a few years when the kids were little. But in more ways than that this trip really was a trip into my memories. Just beyond the wall of mist in this piccie lies a huge chunk of my childhood. As I mentioned once before Mum and Stan met because we were neighbours. 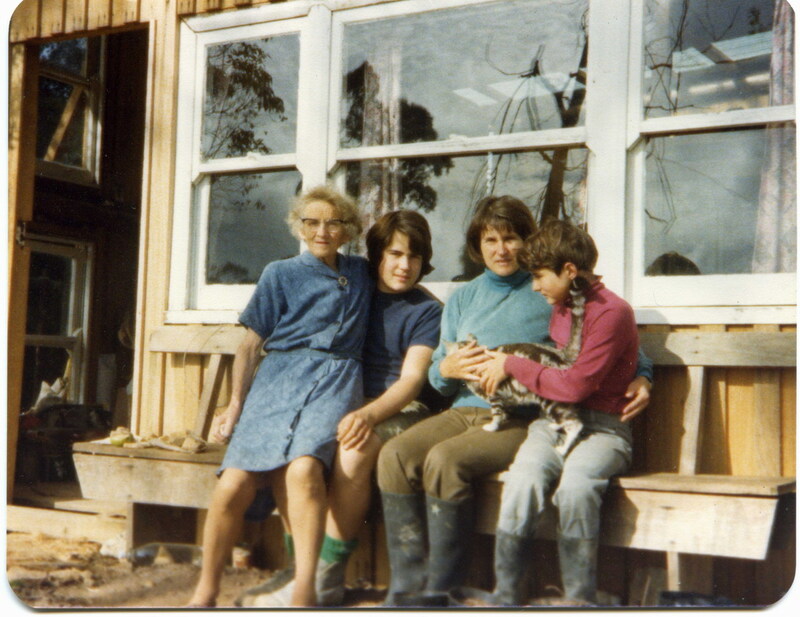 I say in my profile I am the child of Hippy parents, I’m not exaggerating. 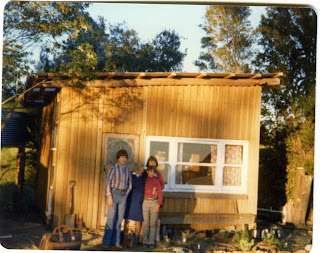 In the 1970s Mum, her then partner Johnny, my brother Ian and me moved onto the property next door to Stan’s. 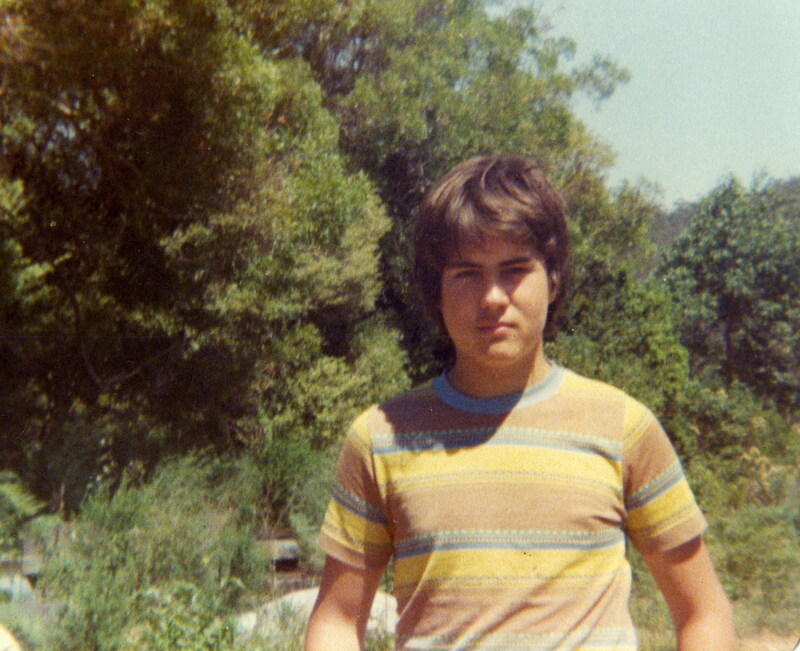 Here I am at the age of about 14. These old photos were mostly taken by Ian and me on a very cheap Kodak 110 camera we had. This is one of mine, from about 1976 or so. 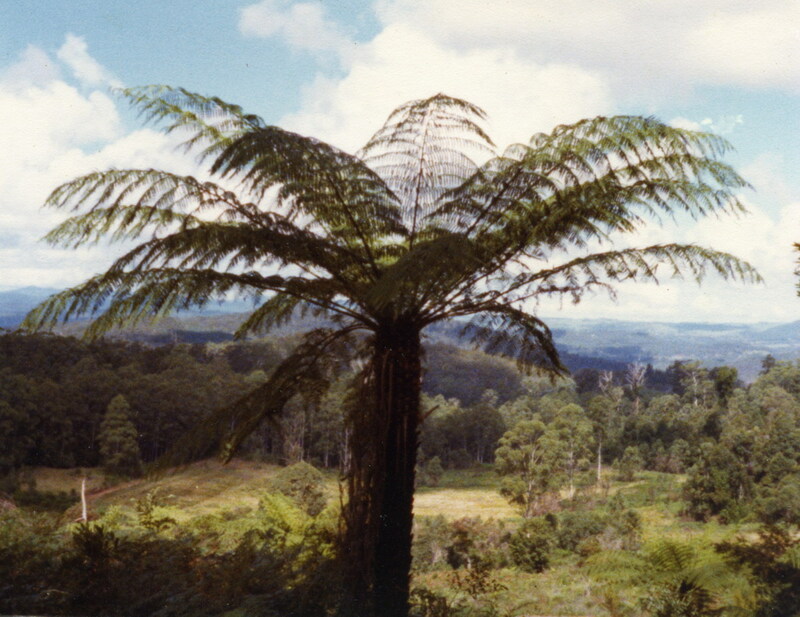 As you can see I am still taking photos with similar subject matter decades later, some things never change ;-) I like the above piccie of a huge tree fern because it hints at the view beyond. You might be able to see a track that comes out of the forest in the bottom left, in fact that is the track Stan and I followed to get out here on my recent trip. It was a strange childhood I lived. At times incredibly poverty stricken, and lacking many of the comforts most of us take for granted. Yet at the same time incredibly rich in experience. Here Johnny loads timber cut off our land. Timber that was cut so we could build this shack. The old lady in the piccie is my Grandma, Mum’s Mum. Here she is sitting on my lap in this family portrait. Grandma had come out from England to stay with us for a year or so. She came from a tidy neat little village in England. I think she probably thought we were all mad, but she loved us and took it all in her stride. Like my mum, she was an amazing person. In our shack we had no power, so no TV. Lighting was a 19th century mix of candles and lamps. Entertainment was playing cards or reading. I read anything and everything I could get my hands on. I guess my already strong love of books was set in concrete in that period. It’s late now and I have to hit the sack for an early start. But tell me shall I go on with my little slice of a personal history when I next post? Wonderful! This was exactly what I'd hoped for. Awesome, I loved the pics because they always give us a glimpse into who we were. Please keep going. I find it so fascinating to learn of other people's lives (so you need to tell us more). I love the pictures. It's just so green there! Great post Al. A lovely trip down memory lane for you and a lovely peek into your past for us. Thank you for allowing us share this little slice of your past. You have such an amazing history! And look where it all started! What a beautiful place! I can imagine the lack of amenities but I am so glad you can also see how enriching it was and is for you! Your family are totally amazing! I love your free spirited mum and zen-like grandma who came all the way there and as you say, took all in her stride"! With such rich blood in your veins how could you not be an artist?!?!?!?! Is that fern tree still around? I suppose not - but I hope it managed to produce mini-fern trees over the years! It's nice having a peek into other folks lives. Nice post. Wow! What an amazing life you've had! Thanks for sharing! Yes please - I want more! It's absolutely fascinating. Ok, more will be coming. Hope you can bear the suspense. I am so pleased you like my little bio. More coming in a few days. I am pleased you like it. More is on the way. It is amazing how it all comes back. I am pleased you liked my post. Hmm I guess my childhood/youth is more than a little unusual. It was amazing, and you are right about my Grandma. Actually I would guess that fern is still around. They can last for decades. Pleased you enjoyed that peek. Thank you! It is unusual! You are welcome. Thank you. More is on the way. In which Al enters the Picture.